There are many orders and groups who claim to belong to the Knights Templars. Will you learn the truth? The Truth shall set you free? Have you heard of the Knights Templars of Britannia? 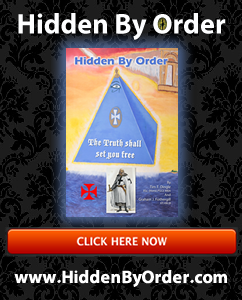 Hidden By Order is one of those rare books that you genuinely can’t seem to put down. Whether it is the sense of mystery or the revelations that occur late in the book I am not sure. Certainly there has not been a better book about the Knights Templar since Dan Brown nearly 10 years ago. It is written as a discovery essay allowing the reader to access the information and make decisions for themselves. It is not a ‘fois gras’ of a book- nothing is force fed or too rich to digest. The structure is contemporary and is a fascinating description of the history and links to other cultures. The reader is lead, like the author with his guide John, on a journey with the shields of logic, science and philosophy. History is always relative (our own relative truth) and is always potentially wrong as it is written by those with an interest in the recording of such events. This book derives information for a wide variety of sources and is clear in its evaluation of the context and significance of that history. Some of the information appears to be completely original in its origin. There is an element of psychology and undercurrent of fear associated with some of the chapters. The novel is part of the exploration of alternative religious history, whose central plot point wide ranging and extra ordinary in its nature. The book will provoke a popular interest in speculation concerning the Holy Grail legend and Magdalene’s role in the history of Christianity as well as how the Knights Templar were part of our own history. This book reveals many of the Knights Templar secret legends, including exposé photos of creatures known to the Templars but ‘hidden by the Order’ (The Knights Templar Order). The Knights Templar offers alternative viewpoints to currently accepted history. The book is necessarily a blend, containing much which is fact but, at times, interpreting facts through conjecture. At such times, there are insufficient facts to provide indisputable proof, and we must employ analysis and rational thinking in order to arrive at a logical conclusion. The subjects covered in the book, while somewhat diverse, are in fact strongly linked, forming evidence of a cover-up of knowledge throughout history, controlling the beliefs of our ancestors, and perpetuating untruths through ruthless censorship for political, monetary or spiritual gain. The book is already causing waves and some of the material is very disturbing. Part of the joy of reading a good book (and this is a good book) is to be stimulated, drawn in to the narrative and left with a sense of real change. By reading the prose carefully, allowing the full story to develop, expand and interlink- will leave you feeling that there are, indeed, many things Hidden by Order.